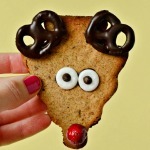 Christmas time is here and that means all the homemade googly eyes need to be used up in the cutest winter-themed cookies and treats one could possibly make. 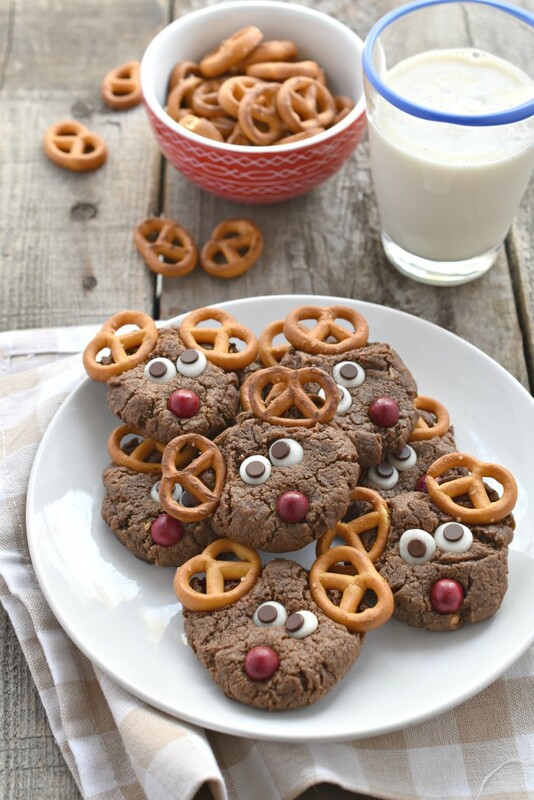 Now this Chocolate Peanut Butter Reindeer cookies recipe had quite the evolution! Sometimes I wish that you could see the behind scenes of what really goes on in my kitchen. You get to see the end result and it looks put together and simple enough but what you miss is the progression it took to get there. There are times when sometimes things do not go as expected and this was one of those kinds of recipes where, out of frustration, I threw certain ingredients across the kitchen. It happens sometimes. I have an anger issue when it takes me 5 times to create a recipe, what can I say? But then I placed those pretzel antlers, allergen friendly candy noses, and googly eyes on these cuties and as they looked back at me with happiness, I melted with love and pride. I forgot about the anger and frustration in an instant. Preheat your oven to 375 degrees. Grease or line a baking sheet with parchment paper. In a bowl, cream the shortening, peanut butter, and brown sugar together with a fork until fluffy. Add the flax “egg”. Mix in the remaining ingredients until you have a nice dough formed. Create a heaping tablespoon of cookie dough and roll between your hands. Flatten gently with the back of a spoon. The cookies will not flatten if you do not do this. Bake for 10 minutes. Open the oven door and pull out the rack with the cookies still on the rack. Press the pretzels, eyes, and nose firmly but gently into each cookie. Allow to fully cool. Did someone say cookie swap? That’s right! 12 festive holiday cookies to make your winter brighter, all thanks to Ancient Harvest. 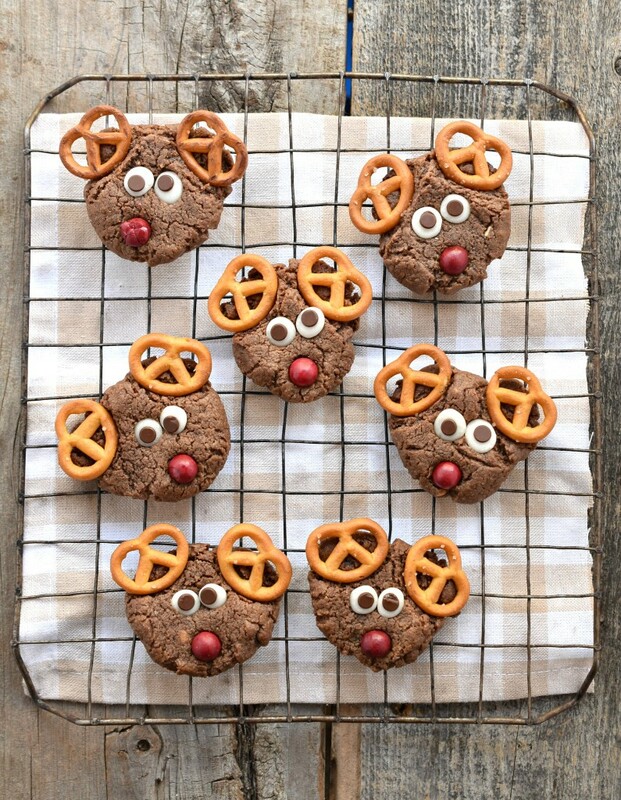 On Monday, December 7 to December 31, you can enter the sweepstakes on their Facebook page by picking your favorite cookie (who wouldn’t love a reindeer cookie this holiday, am I right? hint, hint. Wink, wink. HINT HINT), pin it, and enter yourself to win a Kitchen Aid mixer along with other incredible prizes, valuing around $700. Are those jingle bells I hear on the roof? Though compensation was made for this post, all opinions and text expressed are my own. You can read more about my sponsors here.